Smartwatches aren’t just for adults any more. These kid-centric offerings are ideal for a kid who wants a smartwatch just like their mom and dad. There’s seemingly a smartwatch for every situation now, which is why your kids can also enjoy having their own smartwatch. We’ve checked out the best wearables for your kid, no matter their age or taste. Now, in recent years, smartwatches for kids haven’t had the greatest of reputations. Some are littered with serious privacy and security flaws that are a major concern. We’ve made sure to pick out high-quality smartwatches that don’t have any such issues. That way, your kid can have fun, and you won’t have to worry about who’s snooping on them. Here’s our pick of the best smartwatches for your child. 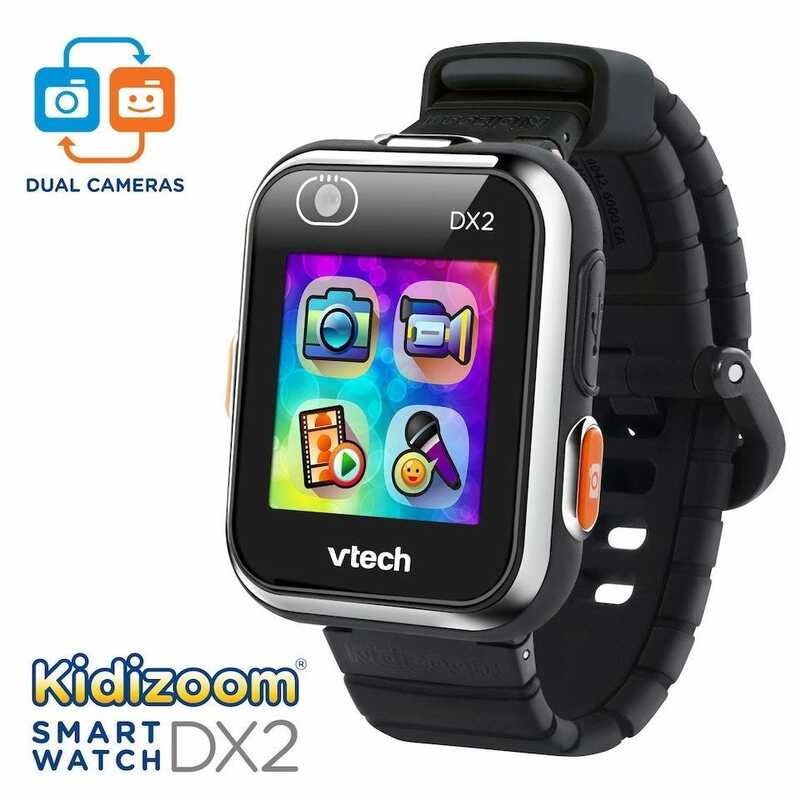 The VTech Kidizoom DX2 is a solid offering from VTech, a company well known for manufacturing durable tech toys for kids. It’s well priced, while also feature packed, and splash proof. Kids can learn to tell the time with the analog and digital watch faces, as well as play some games. There’s a monster catching game that uses augmented reality technology, along with active play challenges in conjunction with the watch’s motion sensor and pedometer. Two cameras add to the fun with kids able to take videos, pictures, and selfies before customizing them or opting to turn them into watch faces. It’s sure to be a hit with most kids, as well as practical too. 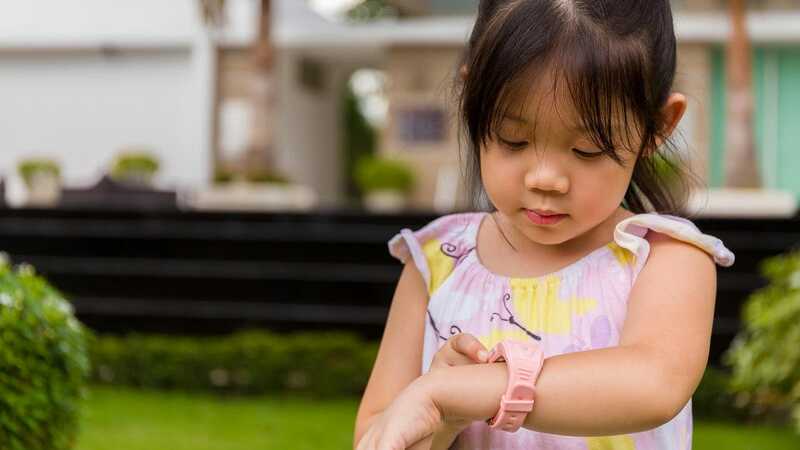 For parents, they don’t have to worry about kids accessing anything they don’t want them to (connectivity is super limited with everything about this watch being self-contained), plus they can limit their child’s usage via parental controls. It is worth noting that a few years back, VTech was in the news for a serious data breach via its Learning Lodge service (the company’s online portal that covers everything from education apps to cosmetic downloads for connected VTech products). Some serious security patching and fines from the FTC later, they’ve fixed things up, but if you’re worried about that you can skip using the Learning Lodge functionality altogether. Kids want to be able to chat to their friends, just like anyone else. The Kurio Watch 2.0+ is a watch that offers messaging features but with some security conscious limitations thrown in. 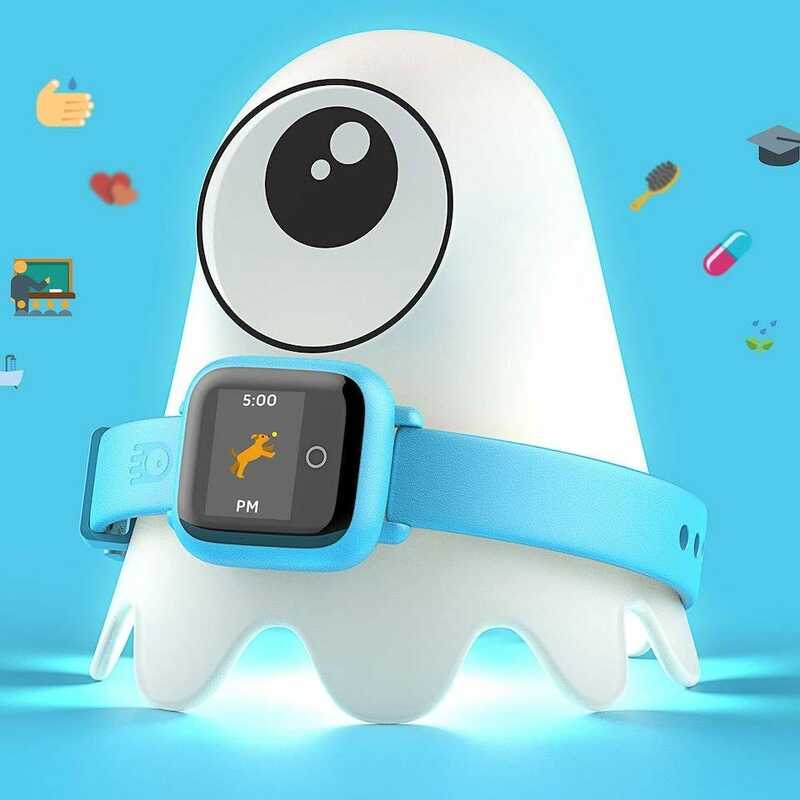 The watch allows kids to message their friends via Bluetooth. They can share texts, emojis, selfies, doodles, and voice recordings with other Kurio watches and Android devices, providing you have the Kurio app installed. It’s reasonably sealed off as you have to pair up devices initially, so you don’t have to worry about anything suspicious taking place. 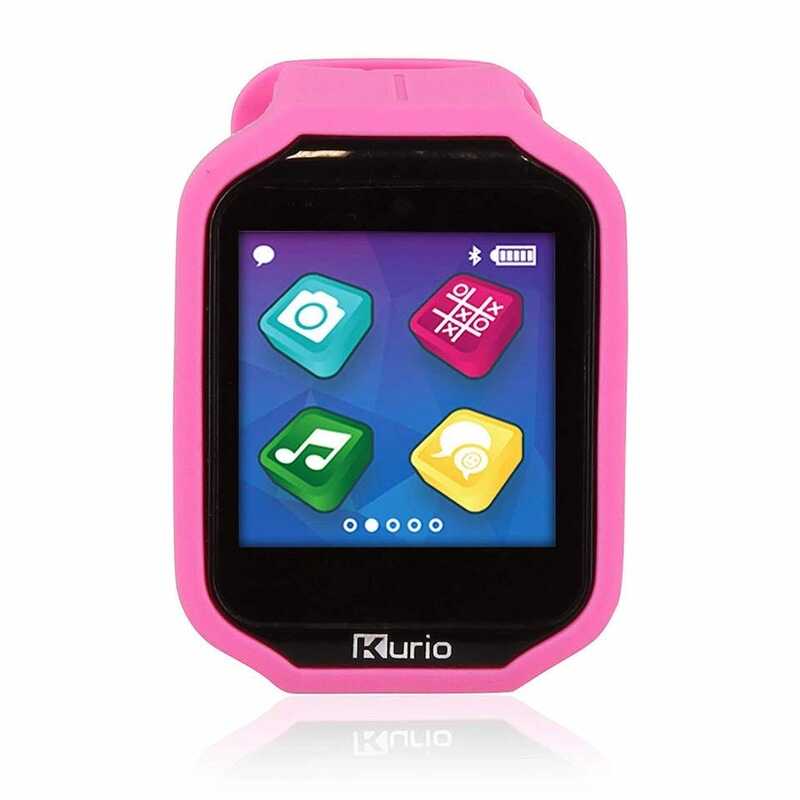 The Bluetooth connectivity also means that kids can play games with friends who also have a Kurio Watch. Elsewhere, there’s an activity tracker, music player, alarm, calculator, calendar, and the means to add ICE (In Case of an Emergency) details, so there’s a lot to like here. 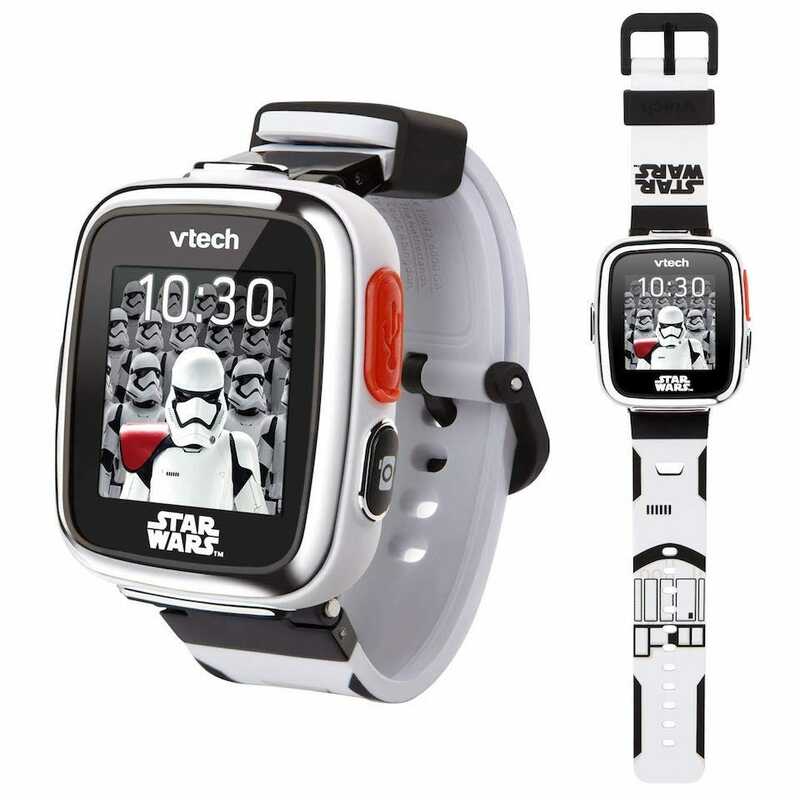 It’s rare to come across a kid that doesn’t go through a Star Wars phase so we’re going to go right ahead and recommend the VTech Star Wars First Order Stormtrooper Smartwatch. It offers a camera, digital and analog clock faces, a pedometer, it’s splash proof… Ohh yes, and Star Wars. It’s the Star Wars functionality that stands out the most here. The smartwatch’s camera includes more than 20 Star Wars themed effects, with each clock face similarly themed. Games wise, there are three Star Wars mini-games including blasting asteroids, escaping Stormtroopers, and racing with BB-8. Plus, there’s a voice changing app so you can sound like an alien. It’s a ton of fun. 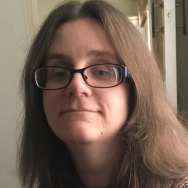 Like the other VTech watch here, there’s no contact with the outside world so parents don’t have to worry about kids getting involved in anything nefarious here. It’s a responsible piece of independence for them. Kids often need a little nudge in the right direction when it comes to learning good habits. That’s where the Octopus Watch 2 comes into its own. It works as a scheduler and assistant that helps parents line up what they’d like their child to do each day, while ensuring the kid knows what’s going on too. Through a mixture of timings and icons (so the child doesn’t necessarily need to be able to read the time), the youngster can know exactly how much play time they have before dinner, or be reminded to brush their teeth in the morning. Essentially, it saves the parent from nagging all the time while also helping the child feel more independent and in control of their own life. Just as great is the night light feature that also doubles as the watch’s charging station. Simply place the watch on the charging dock, and it lights up, giving your child a great (and cute) night light alongside their cool new watch. Don’t worry though—it’s also possible to switch the night light off too if your kid prefers darkness. On top of that, the cute nightlight base also works as a wake-up alarm clock, lighting up in the morning when it’s time to get up. It also works as a fitness tracker on top of all that. And parents? Don’t worry about your kids accessing inappropriate content or messaging people. This is a self-contained watch that’s all about building good habits and nothing else. No camera, no connectivity (beyond Bluetooth pairing to the parent’s phone to program the child’s schedule and watch settings), just fun watch faces and habit building. Teenagers want a smartwatch that looks way cooler than the others listed here. Admittedly, they probably want an Apple Watch but do you really want to entrust them with something so expensive straight away? Buy them the Ticwatch E and assuming they don’t trash it, consider a more expensive smartwatch once they get older. The Ticwatch E is a stylish Android Wear 2.0 based smartwatch. That means plenty of options courtesy of the app store, as well as extensive fitness tracking via Google Fit. 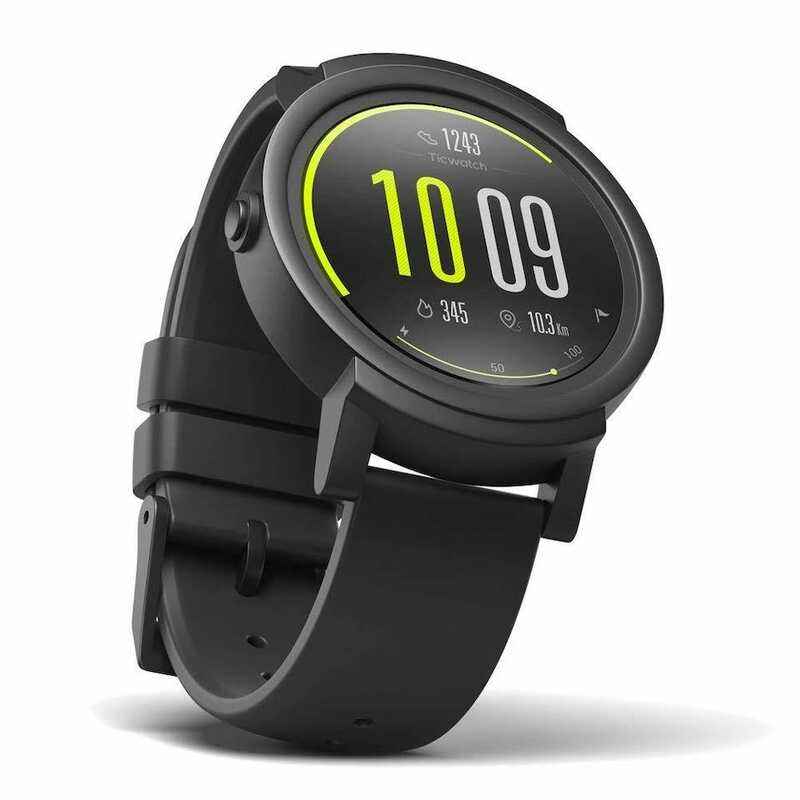 There’s a built-in GPS as well as heart rate monitor, so it’s perfect for more active teens. They can also connect it to their smartphone, so they can receive notifications as well as exchange messages through it. There’s no NFC support but that’s a relatively small price to pay for such an inexpensive smartwatch. It’s a great option for teens that want something a little more grown up.